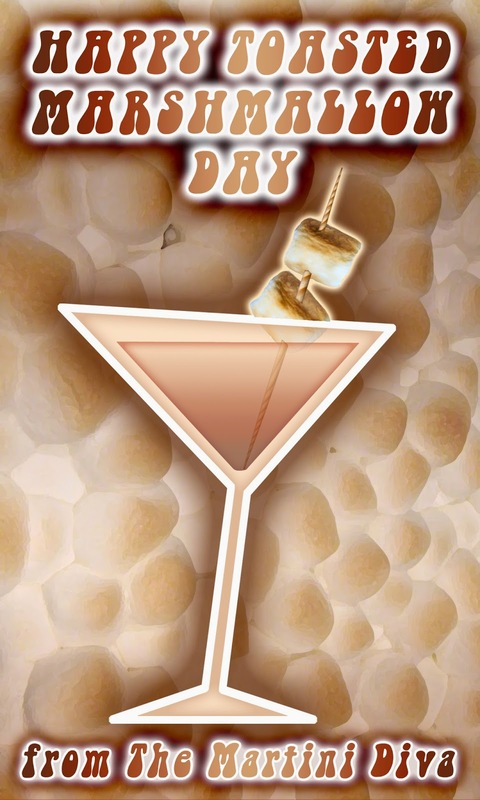 Toast to NATIONAL TOASTED MARSHMALLOW DAY with a Toasted Marshmallow Martini! I don't know who first thought up the idea of toasting marshmallows but whoever it was changed camping out forever. You can't go anywhere near a campfire without a bag of marshmallow and a knife to whittle a few toasting sticks. It's sacrilegious not to have at least one gooey, sticky chunk of warm sugary goodness if you're sitting by a crackling wood fire. Whoever it was, thank you. We lift our cocktail glasses and a hold a marshmallow covered stick over flames in your honor today. Chill your martini glass in the freezer. Place several of the mini marshmallows on the skewers and toast them over the stove burner, a small candle, or torch them with a kitchen torch to caramelize them to a nice golden brown. Set this aside. Pour the vanilla vodka, Bailey's, Frangelico and the half & half into a cocktail shaker with 1 cup of ice and shake until well blended. Pour into your chilled glass, top off with your toasted marshmallow garnish and serve. If you really want to have a Cocktail Campfire experience, let your guests toast their own marshmallow garnishes. Set out a bowl of mini marshmallows, a handful of the bamboo skewers and a small votive candle for each guest and let them toast their own garnish! Though today's marshmallow is a sweet confection made up of sugar, corn syrup, water and gelatin, the marshmallow plant itself was used throughout the world as a source for some form of sweet. The Marshmallow plant was also used throughout history as a medicinal substance, primarily as a remedy for sore throats. The first historical reference to marshmallows comes from the ancient Egyptians who, in addition to using the root combined with honey for sore throats, also extracted the sap which they mixed it with nuts and honey for a sweet candy. The traditional marshmallow recipe uses powdered marshmallow root which is difficult to obtain so most marshmallow manufacturers use gelatin or agar in place of the actual plant root.